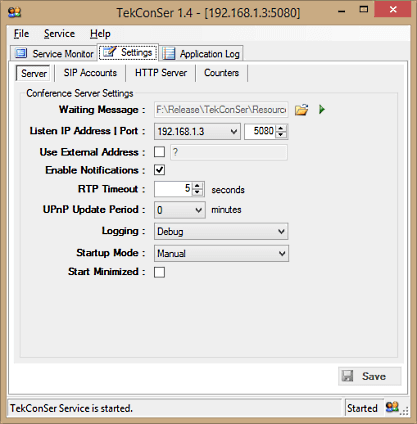 To uninstall TekConSer, double click TekConSer icon at "Add or Remove Programs" from Control Panel. 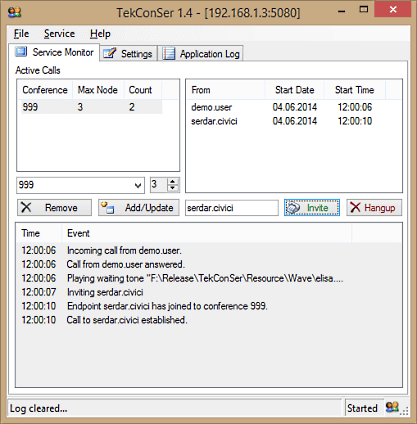 Run TekConSer Manager from Start Menu / Program Files / TekConSer. Enter conference Ids and allowed maximum number participants per conference. Freeware version supports maximum 3 SIP endpoint sessions. Select IP address to be listened on the settings tab. Logging is optional. Configure SIP accounts. If you save or apply the configurations changes, they take effect immediately.